Main European languages spoken in South America. The languages introduced by the process of the European colonization of the Americas are chiefly European, some of whom have given rise to the formation of creoles. 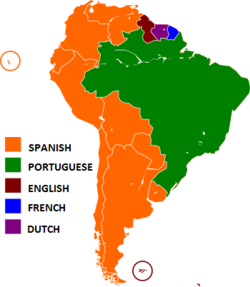 Portuguese is the majority language of South America, by a small margin. Spanish, with slightly fewer speakers than Portuguese, is the second most spoken language on the continent. English in Guyana and the Falkland Islands (Spanish: Islas Malvinas). French in French Guiana, an overseas department of France. 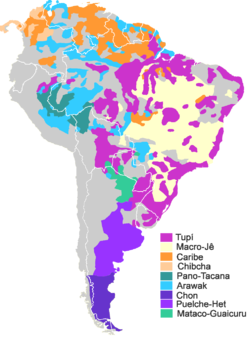 Main language families of South America (other than Quechuan, Aimaran and Mapudungun, which expanded after the Spanish Conquest). Indigenous languages of South America include, among several others, the Quechua languages in Bolivia, Peru, Ecuador and to a lesser extent in Argentina, Chile and Colombia; Guaraní in Paraguay and to a much lesser extent in Argentina and Bolivia; Aymara in Bolivia, Peru and to a lesser extent in Chile; Wayuu in northern Colombia and northwest Venezuela; and Mapudungun in small pockets of southern Chile and Argentina. In Bolivia, Quechua, Aymara, and Tupi Guarani are co-official alongside Spanish. In Paraguay, Guarani shares joint official status with Spanish. In Colombia, the languages of the country's ethnic groups are constitutionally recognized as official languages in their territories; more than 60 such aboriginal languages exist today. In Ecuador, Spanish, Northern Quechua and Shuar are official for intercultural relations. In Peru, Quechua, Aymara, and other indigenous languages are co-official in the areas where they are predominant. There are many other languages once spoken in South America that are extinct today (such as the extinct languages of the Marañón River basin). In Brazil, there are around 135 indigenous languages confirmed. The regions with the most speakers are northern and southern Brazil, where there is a larger concentration of native people. Indigenous populations have been trying to keep their traditions of their homeland, with the help of Funai, the agency responsible for the protection of the native people. 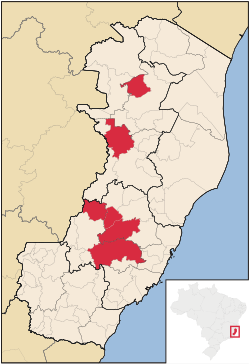 Municipalities that the Talian is co-official in Rio Grande do Sul, Brazil, highlighted in red: Bento Gonçalves, Caxias do Sul, Flores da Cunha, Nova Roma do Sul and Serafina Corrêa. 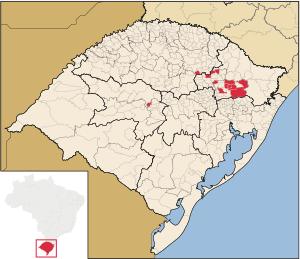 Municipalities that the East Pomeranian dialect is co-official in Espírito Santo, Brazil: Domingos Martins, Itarana, Laranja da Terra, Pancas, Santa Maria de Jetibá and Vila Pavão. Italian is spoken by communities in Argentina, Brazil, Chile, Colombia, Uruguay, Peru, and Venezuela. German is used by some in Brazil, Argentina, Guyana, Suriname, Chile, Colombia, Venezuela, Peru, Bolivia, and Paraguay. Speakers of Arabic (chiefly of Lebanese, Syrian or Palestinian descent), are commonly found in parts of in Brazil, Colombia, Guyana, Suriname, Argentina, Paraguay, Chile (largest Palestinian colony outside the Middle East) and Venezuela. Welsh is spoken and written in the historic towns of Trelew and Rawson in the Argentine Patagonia. There are small Croatian, Greek, Polish, Ukrainian and Russian-speaking communities in Brazil, Chile, and Argentina. There are also many Romani-speakers, originating in Eastern Europe, throughout South America particularly in Colombia, Chile, Brazil, and Argentina. There are Eastern European Romanian speakers, especially in Argentina, Brazil, Chile and Colombia, where Romanian populations live. Hindustani and other Indian languages are commonly found in Guyana, Suriname, and French Guiana. Javanese is commonly found in Guyana, Suriname, and French Guiana. The Rapa Nui Language is a Polynesian origin found in Easter Island, Chile and Maori is also found in Easter Island. Most South American countries mandate the regular study of one or more of English, French, German or Italian. These countries often have advanced cultural language institutes for those respective languages centered in their major cities. ^ Babbel.com; GmbH, Lesson Nine. "How Many People Speak Portuguese, And Where Is It Spoken? | Babbel Magazine". The Babbel Magazine. Retrieved 2019-04-01. ^ Lopez, Michel. "What are the 5 official languages of South America?". e2f. Retrieved 2019-04-01. ^ a b c d e Espírito Santo investe na preservação da língua pomerana, in "Registros Escritos", fifth paragraph. ^ "A escolarização entre descendentes pomeranos em Domingos Martins" (PDF) (in Portuguese). Archived from the original (PDF) on 21 December 2012. Retrieved 24 August 2011. ^ a b "A co-oficialização da língua pomerana (third paragraph)" (PDF) (in Portuguese). Archived from the original (PDF) on 21 December 2012. Retrieved 24 August 2011. ^ "Pomerano!?" (in Portuguese). Retrieved 24 August 2011. ^ "No Brasil, pomeranos buscam uma cultura que se perde" (in Portuguese). Archived from the original on 28 March 2012. Retrieved 24 August 2011. ^ "Lei dispõe sobre a cooficialização da língua pomerana no município de Santa maria de Jetibá, Estado do Espírito Santo" (in Portuguese). Archived from the original on 2 April 2012. Retrieved 24 August 2011. ^ a b Cooficialização de línguas no Brasil: características, desdobramentos e desafios, third page. ^ "Vila Pavão, Uma Pomerânia no norte do Espirito Santo" (in Portuguese). Retrieved 24 August 2011. ^ "LEI Nº 14.951" (in Portuguese). Retrieved 21 August 2011. ^ "Rotary apresenta ações na Câmara. FEIBEMO divulga cultura italiana" (in Portuguese). Retrieved 21 August 2011. ^ "Fóruns sobre o Talian - Eventos comemoram os 134 anos da imigração italiana" (in Portuguese). Archived from the original on 30 July 2012. Retrieved 21 August 2011. ^ "Aprovado projeto que declara o Talian como patrimônio do RS]" (in Portuguese). Archived from the original on 27 January 2012. Retrieved 21 August 2011. ^ a b "O povo pomerano no ES" (in Portuguese). Archived from the original on 21 December 2012. Retrieved 24 August 2011. ^ "Plenário aprova em segundo turno a PEC do patrimônio" (in Portuguese). Archived from the original on 27 January 2012. Retrieved 21 August 2011. ^ "Emenda Constitucional na Íntegra" (PDF) (in Portuguese). Retrieved 21 August 2011. ^ "ALEES - PEC que trata do patrimônio cultural retorna ao Plenário" (in Portuguese). Archived from the original on 14 December 2013. Retrieved 21 August 2011.